For Christmas last year, we got some KitchenAid attachments from my family. Back in January, I posted some of our first attempts, which were great successes. 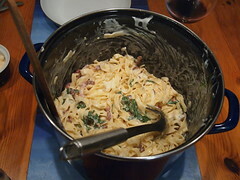 Here is a detailed recipe for fresh Fettucine Alfredo: a simple, fresh pasta and a rich, creamy sauce. I am reusing the images from that post, in case they seem familiar. Sarah’s mom gave her a set of Williams-Sonoma cookbooks years ago. One of them is devoted to pasta and sauces, which I used for inspiration. Below is what I did. Seems like nobody knows Fettucine over here — all I ever see are Tagliatelle. German Wikipedia says they are similar noodle styles, one originating in Rome and the other in Bologna. Still, I wonder why I hear one name more in the US and the other more over here. I’m not big on kneading stuff. I try to avoid that wherever possible — seeking out no-knead bread recipes and stuff. In this recipe, I let the machine do the kneading for me. 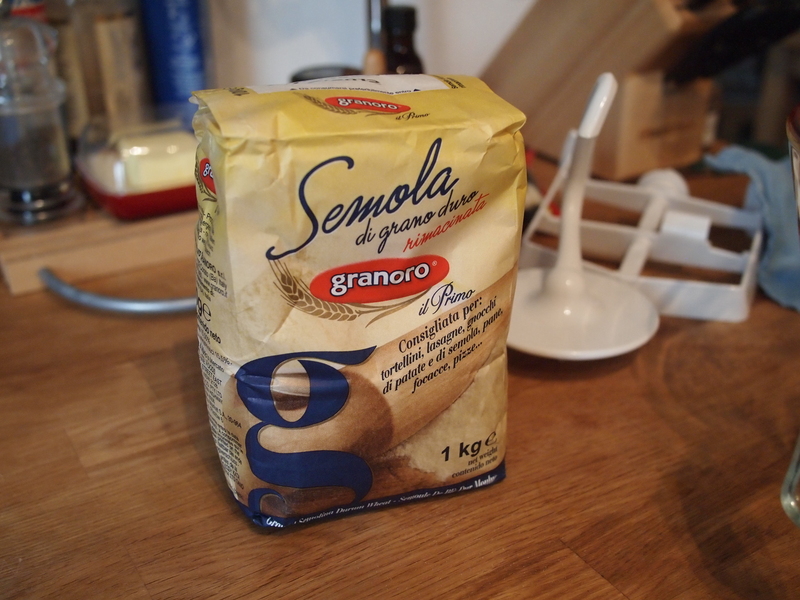 Semolina flour: it makes a big difference to the texture. I’ve tried making all whole-wheat fettucine/tagliatelle before, but found that the texture was not conducive to cutting mechanically — the dough wouldn’t get thin enough to be cut properly in the cutter. So those turned into hand-cut whole-wheat pappardelle, which were also quite tasty with the Alfredo sauce. 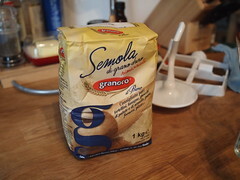 Even though you can find all-purpose flour recipes for homemade fresh pasta, spring for the semolina. The 50/50 mixture of all-purpose flour and semolina flour here made for an easy-to-roll, easy-to-cut texture. 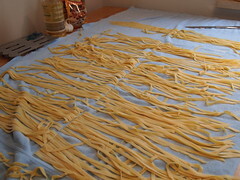 It was pliable, but not so much so that gravity would stretch the flat sheets of noodles while lining them up in the cutter. This sauce is not for the hard-arteried or dairy intolerant. 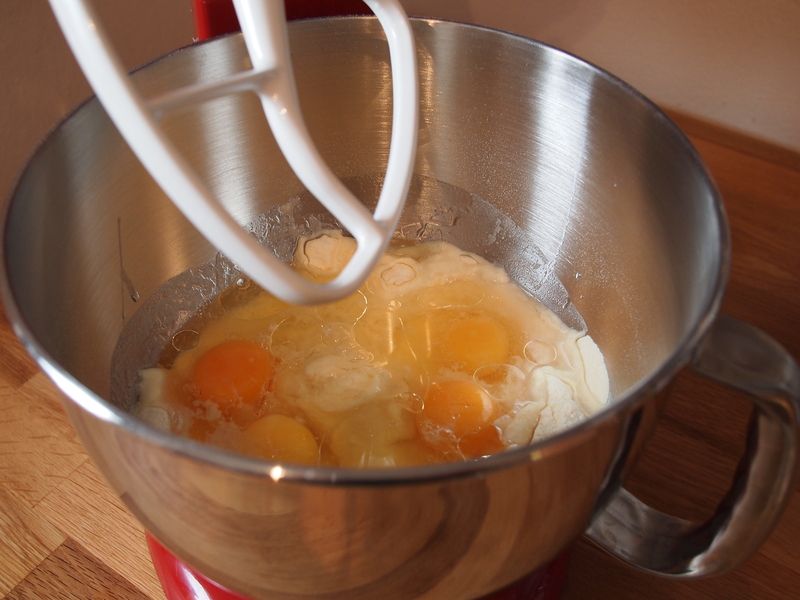 Butter AND cream are the main ingredients, and it gets thickened up with…cheese! 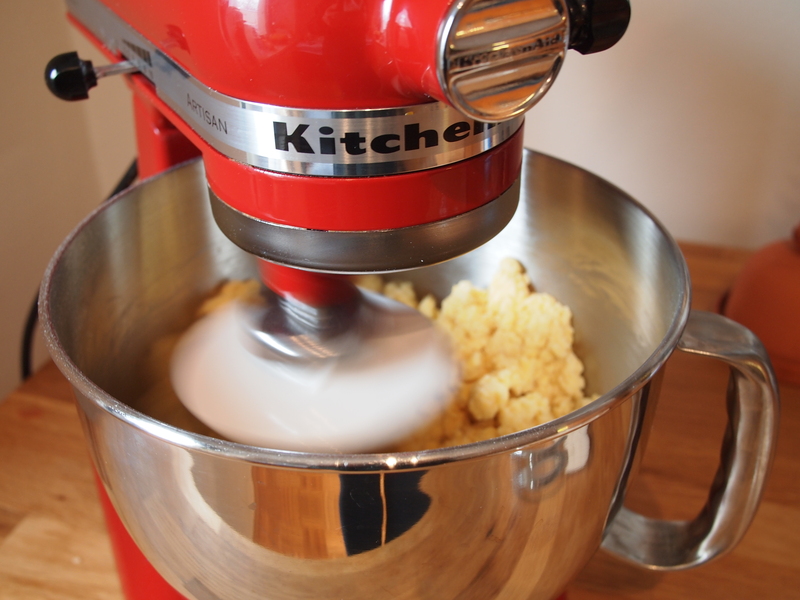 Mix all the dry ingredients together well in your mixer at medium speed. Then add the eggs and mix at low speed for few minutes. Switch to the kneading hook and knead at slow or medium speed for another few minutes. Drizzle in the olive oil at the latest when you switch to the kneading hook. You’ll know that you’ve the machine has kneaded enough such that the dough is squishy, but still a little crumbly, climbing the walls of the mixer bowl with every pass of the kneading hook, and caving back in on itself. After that has happened a few times (feel free to pause the mixer and help it fall back into the path of the kneading hook), it’s done. This whole dough step is less than 10 minutes, and that’s if you go slowly and carefully. Smoosh the dough together into a big mass and then separate it into chunks bigger than a golf ball, but smaller than a racquetball. I get about 8 chunks. Wrap them in plastic wrap and let them rest for at least 30 minutes. You can get the sauce ingredients ready while you’re waiting. Unwrap and then roll each dough chunk through the pasta roller at the #1 setting a few times, folding it in on itself, until you’ve got a smooth, flat piece of dough. Then start rolling it through on successively tighter settings at least until you get to setting #5 (one pass at each setting is generally enough). That makes for relatively thick, sturdy noodles, which is what I wanted. #6 seems to be the ideal thickness for our tastes. In the past I have rolled out all my dough into flat sheets before cutting it into noodles, but most recently I have left each dough chunk wrapped up in plastic wrap until flattening it and then cutting it immediately. This means I have to switch from the flattener to the noodle cutter and back for each dough chunk, but that’s fine with me. 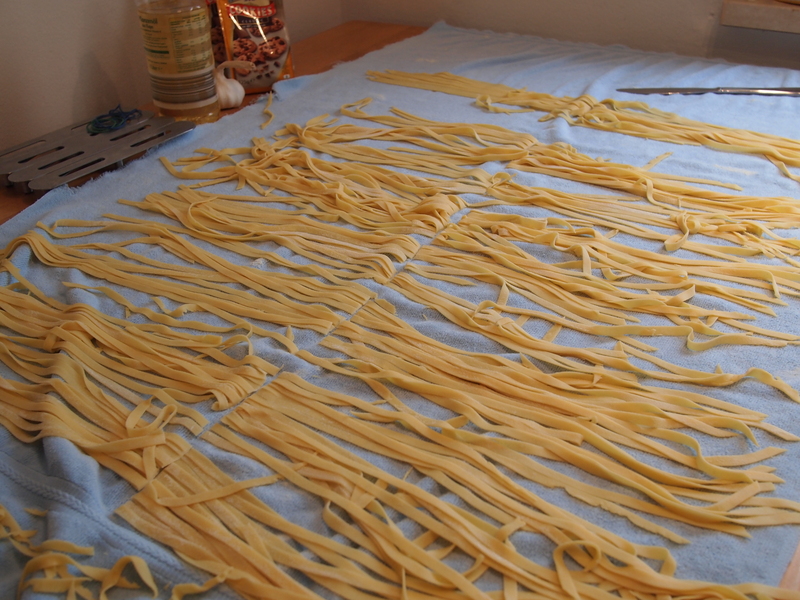 The pre-cut sheets of noodles spend less time drying out that way. I want them to dry slightly, dusted with flour, AFTER they’re cut into noodle shapes. At this point you can use them immediately or freeze them for later use. Cook the pasta in boiling water until it floats and you have reached the texture you prefer. It won’t take long; maybe 3 or 4 minutes (less if you like it really chewy). A few of the noodles are bound to stick together. Don’t worry about it — they’ll cook up just fine. Drain it, re-pot it, and stir in the sauce. Put the butter and the cream in a small saucepan on medium heat. Bring it to a boil, stirring quickly and constantly. When it starts to froth up, turn the heat way down (remove it completely from the heat if necessary to keep it from overflowing), and stir in most of the cheese (reserving a little for plate-side garnishing), and then the seasonings. Taste and adjust as necessary. It’s a little scary how quickly these things can come together once you’ve done it twice. Try not to make a habit of it. Oh my gosh, this sounds delicious! I’m worried enough as it is about my lack of fiber intake…This looks yummy! I wanna see the final product! Very cool you do homemade pasta. I am far too impatient for that. Hmm, no pictures from this batch. But here is the same cut of noodle with a similar white sauce and some bacon and arugula in there, too. If you think about the time involved, maybe you can rationalize away the extra effort up front: fresh pasta (or fresh pasta frozen) cooks much faster than the dried variety.